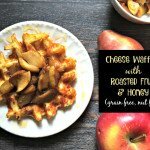 These tasty cheese waffles are grain free and nut free and topped with roasted apples, pears and honey! Mix the apples, pears, butter and coconut sugar in a baking dish and roast in the oven for 30-40 minutes until nice and brown and bubbly. In the meantime about 5 minutes before your fruit is done, mix your egg, cheese and cauliflower or shredded apple. Add mixture to your waffle iron and cook until nice and brown. When fruit is finished roasting, top your waffles with the fruit and then drizzle honey over top.